You might know the name Van Gogh, but do you know who he really was? Vincent van Gogh is one of the world’s most famous painters. 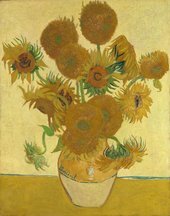 When you start school, one of the first artworks that you will ever look at is probably Van Gogh’s Sunflowers. This painting is very famous. Look at its bright yellows and the way each of the fourteen sunflowers are painted differently. Van Gogh painted Sunflowers for the room in the yellow house he was renting in Arles, France. His friend, the painter Paul Gauguin, was coming to visit and Van Gogh wanted to redecorate. Would you like a painting of Sunflowers in your bedroom? No thank you - there's too much yellow! Today, most people know the name Vincent van Gogh. However, when he was alive, he was not very famous at all. Since his death, he has become one of the most successful painters in history. People across the world have admired his unique style. If you look closely at his paintings, the brushstrokes are broken up. It is as if you can see each time Van Gogh put his brush on the canvas. Do you like this style? 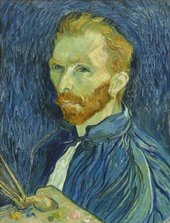 In total, Van Gogh made around 2,100 artworks. So, if you only know Sunflowers, there are many more paintings by him to discover. Van Gogh was born in the Netherlands, but travelled across Europe. He went to France, Belgium and England. When he was in London, he was inspired by all the art he saw in galleries. Van Gogh’s brother, Theo, worked in an art gallery and introduced Van Gogh to many artworks. Van Gogh was interested in painters who were painting everyday life. When he was 27, he decided to become an artist. Up until then, he had been a teacher, a shop assistant and had dreams of working for the Church. All of these experiences inspired his art. It is a really sad story. Van Gogh struggled with mental health problems. This meant that he sometimes felt very angry or sad and was not able to control his emotions. Sometimes, he would harm himself and have blackouts. Van Gogh used painting as a way to express his emotions and way to help with his illness. Van Gogh’s did not get the help he needed and there was not the same understanding of mental health as there is today. Van Gogh felt alone and was not able to handle the pressure of his emotions. He died by suicide. He was only 37. It is sad to think of all the wonderful artworks he could have painted had he gotten better. Van Gogh liked to paint the places he visited. When you look at his paintings, you can almost imagine you are there with him. In Farms near Auvers, the bright greens make you feel like you are standing in the French countryside. This painting was made towards the end of Van Gogh’s career. Earlier, he had used darker colours. As he grew older, he liked using lighter colours. Do you like dark colours or bright colours? Van Gogh painted portraits of many different people he met, but he really liked painting portraits of himself. He made over 30 self-portraits. You can also try and paint your own self-portrait. Try looking at yourself in the mirror or in a photograph to get you inspired.